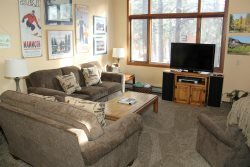 Above Standard Two Bedroom with Loft & 3 Bath townhome located walking distance to the Canyon Lodge Ski Lift Area in Mammoth Lakes. Remodeled kitchen and baths. Granite counter tops and re-circulating heating system. Sleeps up to 8. Each bedroom has 1 queen bed, and there are two bunk beds & 1 queen bed in the loft. 4 Large Flat Screen TVs & BLU RAY Netflix Interface in Living Room, Stereo/ CD player. (1300 sq. ft.) Phone in unit (760) 924-3087. Wifi Internet Access in the unit. The unit is 3 levels...you enter from an enclosed mudroom. The two bedrooms & 2 full baths are located on the first floor, the second floor is the living room, kitchen, dining room and the third floor is the loft. The third full bath is located off the stairwell halfway up to the loft and the loft is enclosed except for the stairwell area. There are 2 outside parking spaces available. Chamonix Recreation room with large screen TV, reading area, ping pong, foosball, and business center with fax, copier, computers w/ internet and laptop hook-up. Sauna, hydro spas, seasonal/summer swimming pool & BBQ area. Coin-operated laundry facilities located in the common area near the office. COMPLIMENTARY INTERNET and CABLE TV are provided, however NO REFUNDS will be given for connectivity problems or Internet failure. TOT LICENSE 1968-CX99. Great place to stay to hit the slopes! Thank you. We have been coming to Chamonix off and on for the past 12 years and this year was great again. The trip was, great and the accommodations were perfect. Your system makes the whole system easy and care free. Great place every time!! Chamonix is my go to spot in Mammoth!! We were very happy with our stay. Cant wait till next year. Accommodations were homey and we had everything we needed in the kitchen, even baked a birthday cake. Love the unit and will rebook it next year. You guys do a great job...and the cleaning staff is excellent. Me and my family enjoyed our stay at CX99. We got in and the place was clean and smelled good... CX99 makes us feel at home... It has everything you need and its very close to the ski lift and the jacuzzi. We will definitely come back... Thank you for the smooth transaction.